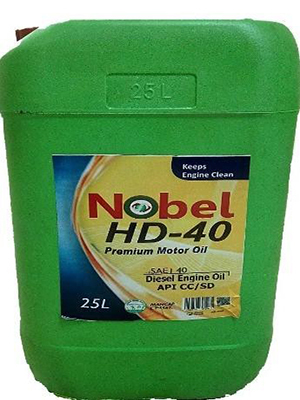 Nobel HD 40 is a high quality monograde diesel engine oil blended from high quality base oilsand additives to satisfy severe practical applications required for modern combustion engines. They contain an effective balance of detergents and dispersant to minimize the formation of sludge and deposits. Nobel HD series are recommended for the lubrication of diesel engines for passenger’s cars, commercial vehicles as well as gasoline engines for commercial vehicles and contractor equipment. They can also be used in gear and hydraulic applications if the builder approves the use of engine oil.